PTFE is principally used as a gasket material because of it’s capability to remain unaffected by the majority of chemicals used in industry. It is also classified, in most cases, as a food grade material, making it acceptable to both medical and food production industries. 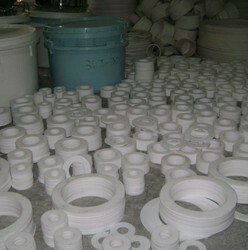 There are three basic types of PTFE gasket materials. 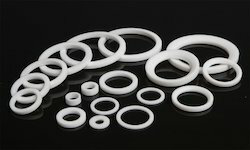 PTFE Machine Gaskets offered by our organization is available in standard sizes and grades. Designed using latest industry standards of quality and performance, this range is widely acclaimed for its fine finish and impeccable quality. Besides, clients can avail this gasket from us at nominal prices. Stock virgin, mechanical, glass-filled and bondable PTFE gasket material in thickness from 0.25mm to 6mm, in roll form from 150mm to 1200mm, and in sheet from 75 to 300 square cm. Billet quantities are available for the most economical pricing. Special widths can be sized to order in long rolls with close tolerances.